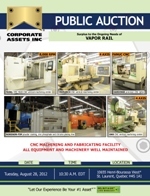 Corporate Assets Inc. | Vapor Rail - Corporate Assets Inc. FEATURING: NORDSON powder coating/zinc plating line consisting of (7) stage tunnel type wash/plating line, FMI gas fired dry-off oven, NORDSON powder coating paint booth, FMI gas fired bake oven and 750' approx. monorail conveyor; FADAL VMC 40/20 CNC vertical machining center; OKK MCV 520 CNC 4 axis vertical machining center; MONARCH VMC 45 CNC 4 axis vertical machining center; HARDINGE CNC high speed precision lathe; MONARCH METALIST CNC turning center; JONES & SHIPMAN 10"x24" universal cylindrical grinder; NORTON 8"x24” hydraulic surface grinder; CINCINNATI gap bed engine lathe; STRIPPIT 6-2000 hydraulic sheet metal fabricator; LODGE & SHIPLEY 10' x 1/4" mechanical shear; (3) WELD-O-MATIC 30 KVA spot welders; (8) CANOX 304 C-CC/CV digital MIG welders, HAEGER HP6-B 6 ton hydraulic hardware insertion press, CANOX C-SW300 AC/DC TIG welder, PROCECO MINI TYPHOON rotary table automatic parts washer, perishable tooling, factory support equipment, and much more!